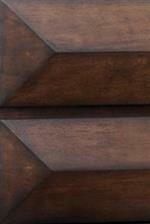 The rich warm tobacco finish softens the clean lines created by the dresser drawers geometric pattern. 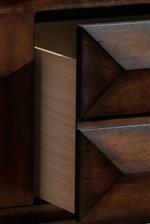 This blending of crisp lines and warmth gives dimension to the slight honeycomb feel of this dresser. 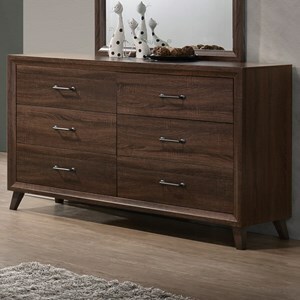 With dust proof bottom drawers and felt lined top drawers this dresser is ready to safely store your clothes in style. 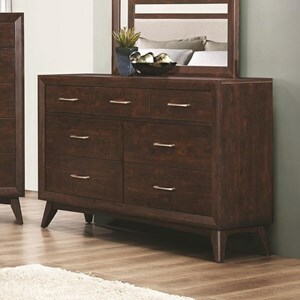 The Anthem Mid-Century Modern Dresser with 8 Drawers by United Furniture Industries at Rooms for Less in the Columbus, Reynoldsburg, Upper Arlington, Westerville Ohio area. Product availability may vary. Contact us for the most current availability on this product. The rich brown finish in this collection makes your bedroom a warm and inviting place to relax at the end of a busy day. Adding just a hint of delicate flair the honeycomb style geometric pattern on the drawers helps bring balance to the clean lines and medium finish of these pieces.With lots of storage space in every piece this collection brings order and a unique mid-century modern style to your life. 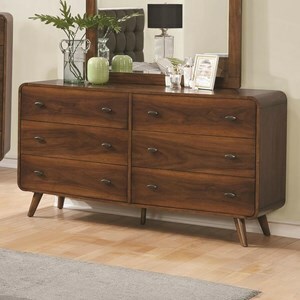 The Anthem collection is a great option if you are looking for Mid-Century Modern furniture in the Columbus, Reynoldsburg, Upper Arlington, Westerville Ohio area. Browse other items in the Anthem collection from Rooms for Less in the Columbus, Reynoldsburg, Upper Arlington, Westerville Ohio area.